Some people forget that Final Fantasy VIII had a second main character to complement Squall Leonhart. 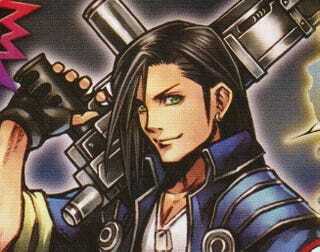 Square Enix reminds them by adding Laguna Loire to the fighting roster of Dissidia 012[Duodecim]. When I say some people, I include myself. I replayed Final Fantasy VIII on the PSP earlier this year and found myself completely surprised when play shifted over to the trio of Laguna, Kiros, and Ward. Hopefully the appearance of the president of Esthar in the sequel to Square Enix's PSP Final Fantasy fighting game will help cement Squall's possible father in my memory. Check out the scan from Japan's Weekly Shonen Jump for a look at Laguna's flashy special attacks. Thanks to SlicedBread for pointing us to the image!